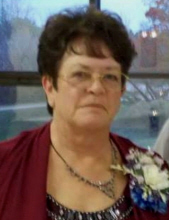 Sandra L. Tscharnack age 65 of Hartford, Wisconsin passed away Sunday, August 12, 2018 at Serenity Hospice in Waukesha surrounded by her loving family. Sandy was born on February 21, 1953 in Milwaukee, WI to Leila L. (nee Madsen) and Edward Tscharnack. She worked for Oconomowoc Residential Programs for many years as an outreach counselor. Sandy is survived by her life partner, Jim Groleau; loving sons, Jeff Disch of Hartford and Jon (Jennifer) Disch of Oconomowoc; cherished grandchildren, Hunter, Tanner, Taylor Disch; dear sisters, Susan Soch and Dorothy Tscharnack. She is further survived by Jim’s children, Crystal Wold, Ashley and Jimmy Groleau and many loved nieces, nephews, other relatives and friends. She is preceded in death by her parents and nephew, Richard Rodeghier. A Memorial Service for Sandy will be held Friday, August 17, 2018 at the Shimon Funeral Home. Family will greet relatives and friends at the funeral home on Friday from 4:00-6:00p.m. To send flowers or a remembrance gift to the family of Sandra Le Tscharnack, please visit our Tribute Store. "Email Address" would like to share the life celebration of Sandra Le Tscharnack. Click on the "link" to go to share a favorite memory or leave a condolence message for the family.